With P2P lending, you can avail quick personal loans or lend money online to earn great returns. Lendbox is India's leading peer to peer lending marketplace that connects high quality creditworthy borrowers with smart lenders online. Lendbox is an RBI (Reserve Bank Of India) registered NBFC-P2P Lending Company and operates adhere to RBI released guidelines for peer to peer lending to provide a hassle-free borrowing and lending experience. How Peer To Peer Lending Can Help You? A peer to peer lending platform connects credit seeking individuals with lenders willing to multiply their surplus wealth. Lendbox has been trusted by doctors, engineers, businessmen and many more for their investing and financing needs. Why you should invest in p2p lending? Lendbox makes money lending much more safe, easy and rewarding in India. With p2p lending, you can create a seamless passive income stream with regular monthly repayments. We operate with a mission of keeping our costs low compared to traditional financial institutions by cutting out the middleman and pass all of the the savings directly to our investors who get high returns and borrowers who are charged low interest rates. Every borrower at Lendbox goes through a strong screening process of over 200 data points verified by experienced underwriting professionals. With P2P lending, you can earn better returns than most traditional investment options. Interest rates at Lendbox range between 12%-36% depending on the risk appetite. Peer to peer lending or p2p lending is a great alternative investing platform. It is easy to understand and more rewarding than traditional investment options. Over 10,000 investors actively use Lendbox to grow their savings. Simply register with your basic KYC details for free and pay a small activation fee of Rs.500 to get access to our huge pool of verified credit-worthy borrowers and diversify your investment across various categories and start getting repayments with EMI's from the very next month. Peer to peer lending or P2P Lending, is the practice of borrowing and lending money directly through an online platform like Lendbox, making it affordable to get loans online compared to banks. Through peer to peer lending, Lendbox is poised to change the way India lends and borrows. At your discretion, you select the people you want to invest in or get a loan from. At Lendbox, you have the power to choose your terms and enjoy complete transparency. I belong to Delhi and I invested Rs. 35,000 in A. Sindhu who is based in Mumbai. Lendbox made this possible in the most seemless way. I found P2P lending at Lendbox is a great platform for serious lenders & serve as one of the avenues for diversification of the overall portfolio. I found the platform & staff to be less restrictive, flexible & always adapting to the constructive feedback. 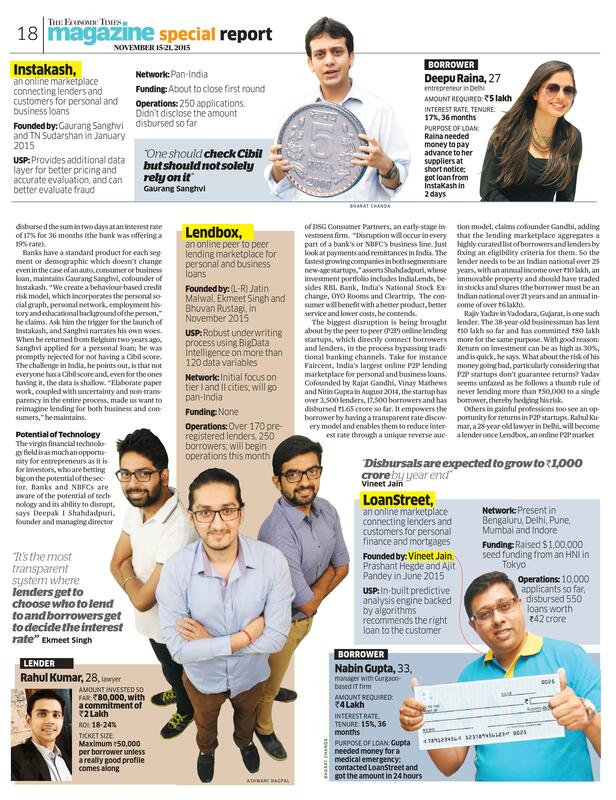 Lendbox lived upto their commitment so far & I wish the team luck for the future path. One of the best Peer to Peer lending platform I have ever experienced. The best thing I liked about Lendbox is that they are professional to the core. The whole experience of borrowing has been excellent and the team was always there to assist throughout the borrowing journey. Customer centric approach of LendBox is really commendable and is definitely a WoW experience. I strongly recommend LendBox to everyone for lending or borrowing needs. Lendbox is a truly innovative P2P lending platform that understands Indian context of borrowing and lending and the related safety. The team is very responsive to queries and the platform has variety of borrowers to diversify risk. Lendbox helped me in the time when i really needed the money. I am really thankful as it helped our family at the time of emergency. Team is really co-operative and they fulfilled what they promised. Lendbox is India's one of the best loan platform and top peer to peer club. My best business partner for all my business loan solution. Always Applied for the business loan got the loan in super fast process. Lendbox is everything they said, quick response, best customer service and quick loan disbursement. If you are in need of a loan then Lendbox is the place to go. I highly recommended. My five star rating to Lendbox Team. Thank you for always supporting me and making my business life easy. LendBox is definitely going the extra mile in terms of customer satisfaction. In P2P lending, I was very unsure of how much support I would receive from a facilitator site, but LendBox just proved to me that it values its business and its customers. Cheers and Kudos. Lendbox does not guarantee any returns on the capital. Lendbox is a tech platform and it does not assume any credit risk on behalf of its users. More than 110,000 users are actively using Lendbox. We look at more than just your credit score. Our mission is to get every creditworthy borrower access to cheap and easy finance.